Bedbook 2 probes the identity of a gallery space that was formerly the domestic interior of a 19th. Century townhouse. A solitary bed acts as a surrogate for the body and houses a video monitor with dual images that function as the open pages (or signature) of a metaphorical book. Hanging from the walls are bedsheets, metaphorical book pages, stained by the rusted shapes that originate in the video. 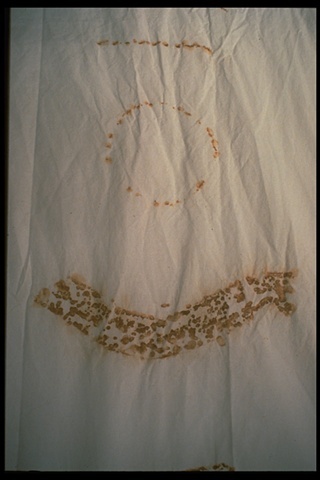 The organic stains on the intimate sheets play off against the distant technological coldness of the unfocused video images, while an audio track plays contemporary songs of frustration and anxiety. Like a book these components combine to create a narrative questioning the viewer's own memory of the bed, a private object exposed in a public space.